Beat eggs, milk, marjoram and 1/4 teaspoon salt with fork or wire whisk until well mixed; set aside. Melt butter in 10-inch nonstick skillet over medium heat. Cover and cook potatoes and 1/4 teaspoon salt in butter about 8 minutes, stirring occasionally, until potatoes are tender. Stir in spinach, tomatoes and onions. Cook, stirring occasionally, just until spinach is wilted; reduce heat to low. Carefully pour egg mixture over potato mixture. Cover and cook about 6 minutes or just until top is set. Sprinkle with cheese. Cover and cook about 1 minute or until cheese is melted. 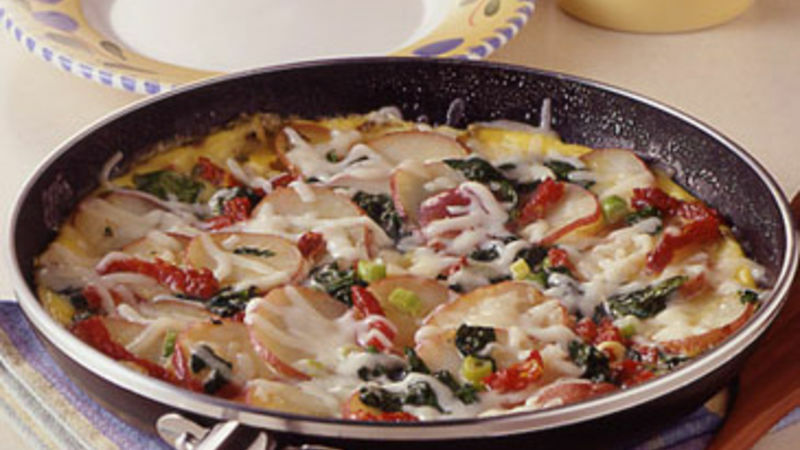 Purchase prewashed and bagged spinach to speed preparation for this tasty breakfast, lunch or dinner dish.